SkinCeuticals Eye Cream uses the power of vitamins, essential oils and rich extracts. Eyes will be hydrated, lifted and brightened until the years simply melt away. Great for all skin types, especially for mature skin. Ideal for those of all skin types, especially aging and mature. Use once daily. Apply with fingertips around the delicate eye area to clean, dry skin. Massage until product is fully absorbed. Use only on the outside corners of eyes. Do not apply to upper eyelid. Aqua / Water / Eau, Cyclopentasiloxane, Ethoxydiglycol, Ectoin, Cetyl Alcohol, Polyurethane-21, Cetearyl Glucoside, Tocopheryl Acetate, Peg-100 Stearate, Glyceryl Stearate, Phenoxyethanol, Polyacrylamide, Steareth-20, Glycerin, Dimethicone, Dipeptide-2, Palmitoyl Tetrapeptide-7, Hesperidin Methyl Chalcone, C13-14 Isoparaffin, Centella Asiatica Extract, Dimethicone Crosspolymer, Methylparaben, Laureth-7, Sodium Hyaluronate, Disodium Edta, Propylparaben, Silica, Juniperus Communis Fruit Oil, Ceramide 1, Ceramide 3, Ceramide 6 Ii, Carbomer, Sodium Lauroyl Lactylate, Cholesterol, Xanthan Gum, Phytosphingosine, Ethylparaben, Isobutylparaben, Butylparaben. 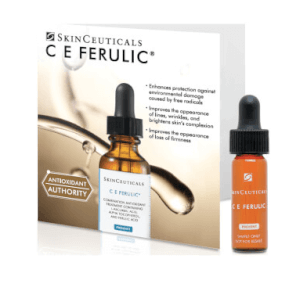 I've been using Skinceuticals for a decade now, with amazing results, and every few years I'll try something new or go "up" to a stronger product to keep up with whats new and my aging skin. This eye cream I bought for my husband, who has a lot of fine lines around his eyes due to squinting all the time- he likes how the pump dispenses the right amount, and the product goes on smoothly and is absorbed quickly. Almost odorless, the texture is rich and the results can be seen in a few weeks- very pleased and will continue to buy! Refreshing and seems to get the job done! Surprised that I like it as much as I do. Have been using the A.G.E eye cream for years but I think this works as well. I only gave it 4 stars as I have only been using for a short time. I started using this product over one year ago. Usually purchased high end brands such as Laura Mercier, Amore Pacific and Guerlain, but this is my favorite. I am in my late 40s and live in a desert climate. This eye cream absorbs quickly and has kept lines at bay. I use the Clarisonic Opal and the combination is fantastic. Definitely recommend! At 33 and living in the northeast, my under eye area was dry and making me look older. I had darkening circles and looked shallow. I use other SkinCeutical products and thought I would give this a try even though I had only used one other eye cream (different brand) ever. I literally saw results in about 4 days! I am amazed and in love with this product. Using it 2x/day and look SO much better. Not too heavy but moisturizing enough for the winter dryness. I have thin aging skin. After using your product only one week, I noted a great difference. I use this every morning under my makeup. It is so firming and light you never see an eye shadow crease. I use the A.G.E. eye cream at night as it is a little heavier giving me the added moisture I need. I decided to switch to this eye cream because I've used SkinCeuticals products before and I've always liked them. I like to switch products every season and now that it is summer I needed something lighter but would still provide the moisture I needed for my eye area. This product has been great. It's provided exactly what I needed. It's not too heavy and works well with all my other products. Also a plus, it hasn't interfered with my lash extensions! !